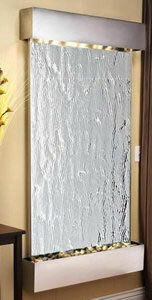 This new large format waterfall features beautiful reflective mirror. Accent overhead lighting heightens the beauty of this incredible piece. 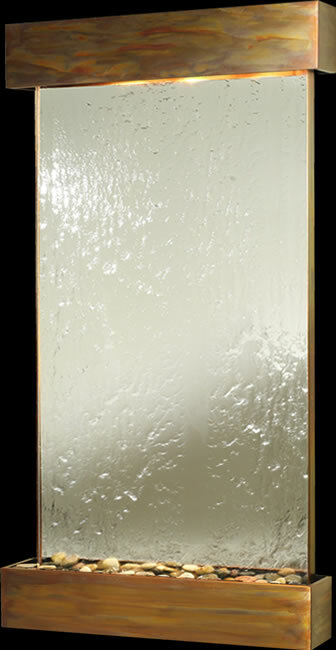 This wall mounted fountain is a pleasure for the senses. A very impressive focal point in any room. Absolutely gorgeous and easy to install! Select from rounded or squared Rustic Copper with clear powder coat finish, Antique Blackened Copper or Stainless Steel Frame to blend with any decor. This new water wall is perfect for logos! 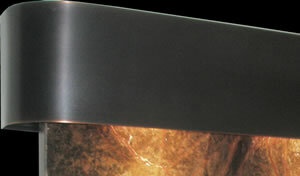 Customize this fountain with your sentiment, company name or logo etched in glass!